So this one’s way off topic and maybe it isn’t even that fun. But so be it. I’m one of those guys who really gets wound up when people say “literally” and they mean “not literally.” As in, “I literally died when I saw that.” No you didn’t, because you’re here right now. Oh, I’ll allow for the possibility that you did in fact die and then were resuscitated but I rather doubt it. 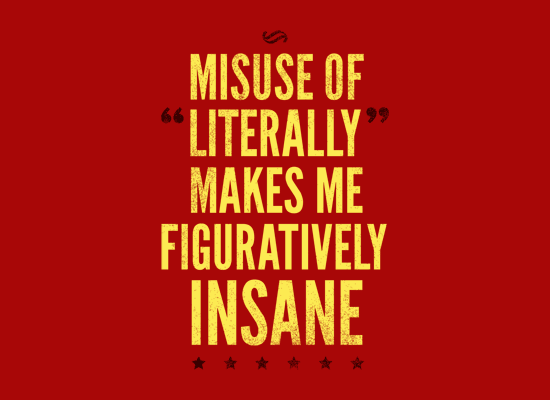 “Literally” originally meant that you were being literal, in other words, that one should take your words exactly as you said them. Its best use is when you’re trying to illustrate something that is usually not true or used as a metaphor. For example, if you have a tree that doesn’t get flowers until June, it is “literally” a late bloomer. Normally that phrase is used figuratively. b —used to emphasize the truth and accuracy of a statement or description The party was attended by literally hundreds of people. c : with exact equivalence : with the meaning of each individual word given exactly The term “Mardi Gras” literally means “Fat Tuesday” in French. Now it seems that greater voices than mine have entered the fray. This guy named Steven Pinker who literally (definition 1) has more credentials than I do says that it’s ok to say “literally” when you mean “not literally.” It seems I’m outvoted. If it’s any consolation though, he does say that if the use of “literally” to mean “not literally” bothers you, don’t do it. He doesn’t say if it’s ok to look at someone else like they are “literally” (definition 1) suffering from sort of mental defect when they do it. I guess that’s up to me. FUN FRIDAY: I know that song!